Roller Burnishing Modern Machine Shop 61 tapers, contours, and fillets for final finishes down to 2 to 4 microinches Ra. Which Parts Work for Roller Burnishing? Roller burnishing is fast and repeatable. Cogsdill counts the fact that its tools can size, finish and work harden parts in a single, seconds-long oper- ation as a principal benefit over grinding, honing or lapping. But not every part is suited to finishing by burnishing, and part preparation is key to achieving such results. 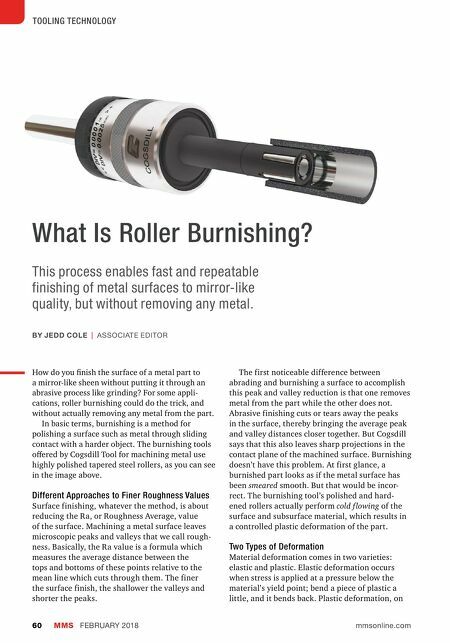 Cogsdill outlines some requirements for parts that are ideal for optimum roller burnishing results: • Material: Though almost any metal can successfully be roller burnished, ductile or malleable metals are best (for example, steel, stainless steel, steel alloy, cast iron, aluminum, copper, brass and bronze). • Hardness: Hardness should be less than 40 HRC, ideally. (Some materials as hard as 45 HRC can be effectively burnished as well.) 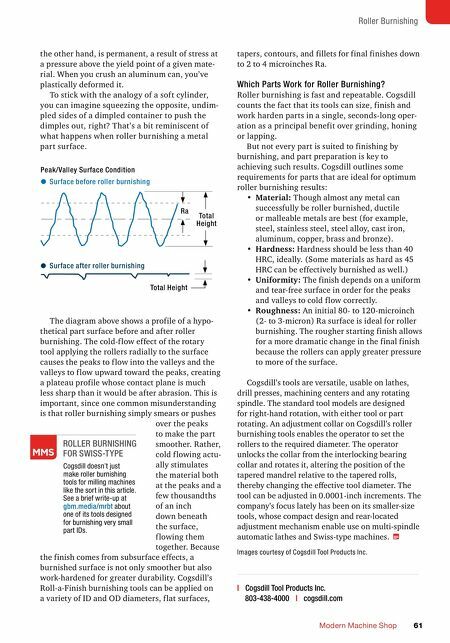 • Uniformity: The finish depends on a uniform and tear-free surface in order for the peaks and valleys to cold f low correctly. • Roughness: An initial 80- to 120-microinch (2- to 3-micron) Ra surface is ideal for roller burnishing. The rougher starting finish allows for a more dramatic change in the final finish because the rollers can apply greater pressure to more of the surface. Cogsdill's tools are versatile, usable on lathes, drill presses, machining centers and any rotating spindle. The standard tool models are designed for right-hand rotation, with either tool or part rotating. An adjustment collar on Cogsdill's roller burnishing tools enables the operator to set the rollers to the required diameter. The operator unlocks the collar from the interlocking bearing collar and rotates it, altering the position of the tapered mandrel relative to the tapered rolls, thereby changing the effective tool diameter. The tool can be adjusted in 0.0001-inch increments. The company's focus lately has been on its smaller-size tools, whose compact design and rear-located adjustment mechanism enable use on multi-spindle automatic lathes and Swiss-type machines. the other hand, is permanent, a result of stress at a pressure above the yield point of a given mate- rial. When you crush an aluminum can, you've plastically deformed it. To stick with the analogy of a soft cylinder, you can imagine squeezing the opposite, undim- pled sides of a dimpled container to push the dimples out, right? That's a bit reminiscent of what happens when roller burnishing a metal part surface. The diagram above shows a profile of a hypo- thetical part surface before and after roller burnishing. The cold-f low effect of the rotary tool applying the rollers radially to the surface causes the peaks to f low into the valleys and the valleys to f low upward toward the peaks, creating a plateau profile whose contact plane is much less sharp than it would be after abrasion. This is important, since one common misunderstanding is that roller burnishing simply smears or pushes over the peaks to make the part smoother. Rather, cold f lowing actu- ally stimulates the material both at the peaks and a few thousandths of an inch down beneath the surface, f lowing them together. Because the finish comes from subsurface effects, a burnished surface is not only smoother but also work-hardened for greater durability. Cogsdill's Roll-a-Finish burnishing tools can be applied on a variety of ID and OD diameters, f lat surfaces, Peak/Valley Surface Condition Surface before roller burnishing Surface after roller burnishing Total Height Total Height Ra | Cogsdill Tool Products Inc. 803-438-4000 | cogsdill.com Cogsdill doesn't just make roller burnishing tools for milling machines like the sort in this article. See a brief write-up at gbm.media/mrbt about one of its tools designed for burnishing very small part IDs. ROLLER BURNISHING FOR SWISS-TYPE Images courtesy of Cogsdill Tool Products Inc.